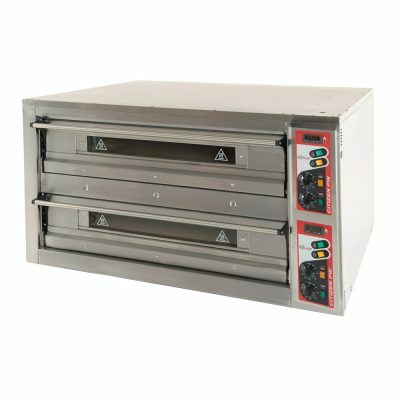 The Italforni EK44 twin deck electric pizza oven, is our most popular pizza oven, ideal for Pizzeria’s, Pubs, Takeaways etc. 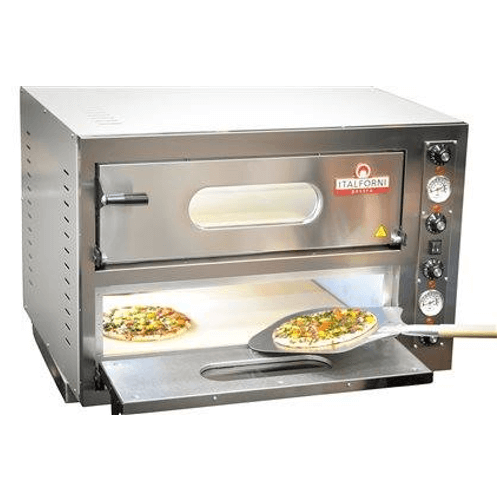 Its compact size still allows you to cook 4 x 12″ pizzas per oven deck.Cooking chamber in aluminium coated steel plate. Refractory baking floor. Counter-balanced opening door. Vapor discharge. Protected interior lighting. Armored heating elements in stainless steel. Cooking chambers with independent electronic/thermostatic power regulation for baking floor and ceiling. THERMAL INSULATION GUARANTEED by the choice of the best materials available on the market and by over 30 years of experience in the design and manufacture of high temperature ovens . Cooking chambers with independent thermostatic power regulation for baking floor and ceiling. They can easily be controlled and set by the operator and they guarantee excellent cooking results of any sort of food . The cooking chamber of the EK oven is in aluminium coated steel plate with refractory baking floor and high performance electric heating elements.